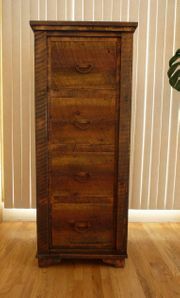 Give LodgeCraft the opportunity to craft a file cabinet for your rustic home, mountain cabin or fishing lodge. Our cabinets are made to complement our executive desks and five you plenty of letter or legal size filing space. Why not add beauty to functionality. LodgeCraft makes a line of lateral files and stacked filing cabinets in our Montana showroom for your viewing.